Mold, mycotoxins and gut health….oh my! To control feed costs, feed ingredient buyers often seek the best price. But the best price for feed ingredients may not always be the best value. Feed represents the largest expense in the yearly budget for livestock and poultry producers. To control feed costs, feed ingredient buyers often seek the best price for these inputs. The best price for feed ingredients may not always be the best value. The quality of individual feed ingredients delivered to livestock and poultry production complexes need to be more fully scrutinized to determine the value of individual ingredients. The quality of feed components should be subject to review by purchasing staff; however, to ensure quality is monitored closely, purchasing and production staff must be closely aligned. Feed ingredient buyers need to be aware of quality when purchasing the feed ingredients for a livestock and poultry operation. The profitability of the business depends on it. Many factors are involved in the quality of grains harvested each year. The most important factor related to the formation of mold is weather conditions at or near harvesting. Molds or fungi can cause both a significant quality reduction and economic loss due to contamination of grains used for food and feed. Requirements for mold growth are: oxygen, water, (high?) temperature and energy. “If these factors can’t be controlled near harvest time, or in storage conditions, then mold growth will flourish, deteriorating feed quality,” explains Tom Marsteller, DVM, Kemin Technical Services Manager. Mold is a profit robber and also impacts performance. 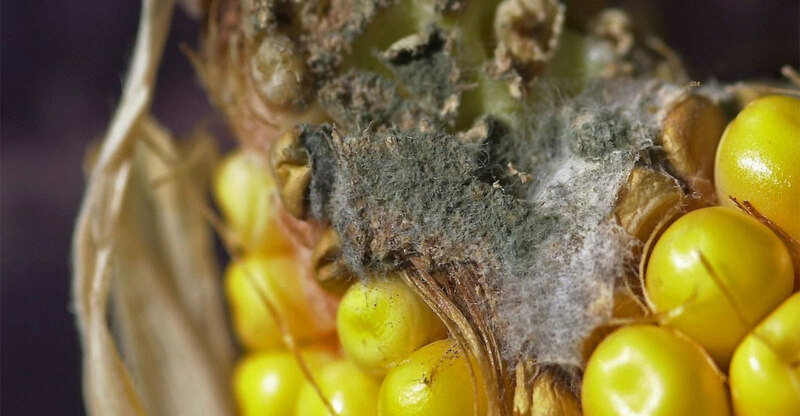 Mold growth robs corn of valuable nutrients. When mold grows, it consumes sugars found in grain and coverts the nutrients to carbon dioxide and water. Estimated losses of metabolizable energy in corn due to mold growth range from 5% to 25% depending on the mold species involved (Bartov et al, 1982; Tindall, 1983). Mold can also impact performance by disrupting beneficial bacteria in the intestinal tract of all livestock and poultry species (Clinical Veterinary Advisor, 2013). It is impossible to guarantee moldy feed as safe to feed to animals, no matter how many tests are conducted on the feed sample. Therefore, controlling any mold growth in the feedstuff is critically important. “Drying grain quickly to 15% moisture or less and storing under cool conditions is best. Long-term storage corn should be taken to 13% moisture or less,” said Marsteller. There are two general categories of grain molds: field molds and storage molds. Common species of field molds are Fusarium, Alternia and Cladosporium. Common species of storage molds include Aspergillus, Penicillium and Mucor. Antifungal agents can be applied and can decrease future mold growth; however, these products do not kill the molds present or eliminate any mycotoxins present at the time of application. The presence of molds in feed have been shown to decrease the energy value, vitamin stores and amino acid digestibility in feed. Mold counts above 100,000 colony forming units can be concerning for nutrient loss in the feedstuffs. When mold counts are above 10 million, the mold will be visible with the naked eye. Mold counts in feedstuffs should be considered a separate analysis versus mycotoxin determination because low mold counts in feed may have high mycotoxin levels. Recent, exciting research with the mycobiome, the fungal microbiome of humans and animals, is helping researchers understand the role fungi play in health and disease. While the mycobiome has fewer organisms to understand than the microbiome (bacterial component), the fungal organisms in the intestine certainly play a role in gut health. Biosecurity of feed ingredients is coming under more scrutiny each year due to the desire to improve livestock and poultry production metrics year over year. Mycotoxins are derived from molds, but not all molds produce mycotoxins. Mycotoxins are metabolites produced by molds and are toxic to other organisms but not the offending mold itself. U.S. FDA and feed regulatory officials have reference doses for each of the common mycotoxins including aflatoxin, fumonisin, zearalenone, T-2 toxin, ochratoxin and deoxynivalenol. Exposure below these regulated levels is usually considered safe. Acute toxic effects of mycotoxins are readily observed and remediation is taken quickly. While the acute toxic effects of mycotoxins are clearly documented, understood and regulated, recent research is exploring the effect of mycotoxins in feed when fed below regulatory threshold levels for prolonged periods of time, or chronic, long-term exposure. “The research demonstrates that chronic, long-term exposure to low levels of mycotoxins may impact the immune system, intestinal integrity and physiology of animals and thus, have a greater effect in animal production systems than the acute toxic effects associated with mycotoxin consumption,” said Marsteller. Research exploring the combination of mycotoxins when final feeds have more than one mycotoxin is emerging because feed ingredients and final feeds frequently have more than one mycotoxin present. Molds can produce multiple mycotoxins. Feed ingredients may be contaminated with multiple mycotoxins and multiple feed ingredients may be contaminated with different mycotoxins in final feed. Combinations of mycotoxins have been shown to have a synergistic, detrimental effect on the host versus a single mycotoxin, especially as it relates to animal performance. When buying feed ingredients for animal production, price is not the only factor. Make sure feed quality is known and understood. Animals will not perform to their genetic potential if molds and mycotoxins are not recognized and managed properly in the feed. Bartov, I., N. Paster, and N. Lisker. 1982. The Nutritional Value of Mouldy Grains for Broiler Chicks. Poultry Science. 61:2247-2254. Clinical Veterinary Advisor. 2013. 204-206. ISBN: 978-1-4160-3969-3. Tindall, W. 1983. Moulds and Feeding Livestock. Animal Nutrition and Health. July/August. p. 5.